SPW020275 SCOTLAND (1928) [Unlocated]. 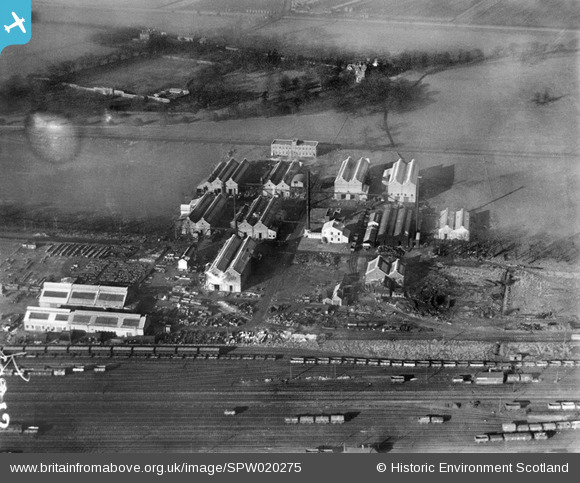 Scottish Dyes Ltd. Works, Grangemouth. An oblique aerial photograph taken facing north-west. Pennawd [SPW020275] Scottish Dyes Ltd. Works, Grangemouth. An oblique aerial photograph taken facing north-west. Kerse House. Owned by the Marquess of Zetland (1844–1929). Originally the site of Kerse castle until c 1637 when the then owner Sir Thomas Hope demolished it and built the first Kerse House mansion. The estate was purchased from the Hope family in 1750 by Lawrence Dundas. His descendant, the Marquess had the property rebuilt and extended in 1830 by the architect John Tait. After the death of the Marquess in 1929 the building was cleared out and the roof was removed from the mansion to avoid paying rates and the estate was sold off to help pay death duties. The site is now the location of an ASDA distribution centre. My brother in law Leo Pelligrini worked at the Dye Works in the 1950's as a time and motion man. A job at the Dye's was well paid but involved shiftwork.